I had a busy ‘I am away from my desk’ week in mid-October, installing my new exhibition Keep in touch. After more than one year in the making, I can now sit back and observe how visitors to Hurstville Museum & Gallery engage with this latest exhibition. Keep in touch takes you back to the analogue world. It highlights the development of early communication services and a few more recent ones, as well as showcasing other forms of communication such as braille, Auslan and community languages. The exhibition provokes different responses from its visitors – depending on their age. 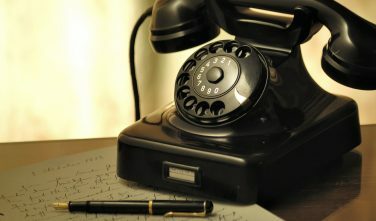 The younger generation is be able to learn about the world of analogue communication and might even wonder how to dial a number on telephones without buttons but a rotating disk. The older generation might feel nostalgic as they recall using some of the items on display from our collection. So, how did I come up with this particular exhibition layout? Curating an exhibition is much more than just researching historic information, writing exhibition text and selecting objects for display. You need to be able to imagine how the exhibition will look in the space and see what’s possible within your budget. I spent a very long time thinking of interactive ideas and the right layout and feel of the exhibition. Over my six years working on exhibitions that will engage the community, getting the layout right has become my favourite part of the project. My focus has shifted from predominantly working with archival material and researching historic facts to more browsing the internet to find a Morse code machine that makes a beeping sound, hiring a 1960s working TV and creating a string telephone from cans. A trip to Kmart for finishing touches was mandatory for this exhibition. Besides my interactive-prop-shopping skills, I also had to use my technical skills to reformat and cut old TV snippets together and create interactive content for two Ipad kiosks. A highlight on one of them is the dial up sound of the 56k modem – I am sure most of you will remember that painful process connecting to the internet. There is a lot to discover in Keep in touch – if you want to check it out the exhibition is on show until 27 January at Hurstville Museum & Gallery.